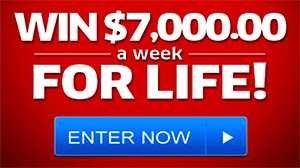 www.VegasWorld.com – VegasWorld One Million Dollar Sweepstakes. This is the first time that $1Million Sweepstakes is promoted and launched by one big player of the online social casino industry. FlowPlay Inc. is a developer of virtual environment and game technologies, offering massive multiplayer games possible with no software, no download required beyond a basic browser. There using Flash ActionScript (Info at FlowPlay.com). One of FlowPlay Inc. biggest adventure is Vegas World at VegasWorld.com a flash online virtual casino world where you can play slots games, video poker and blackjack. You can play Vegas World free online! 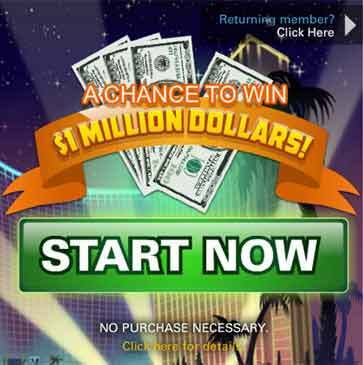 And now the company is promoting their first-ever $1 Million Reward by offering their Vegas World Players a free chance to win real-world cash in a their Virtual-World Social Casino Environment. No Purchase Necessary. Visit VegasWorld for Prize details and Sweepstakes Rules. Once on the website VegasWorld.com folow the on-screen instructions to become a member. One (1) Grand Prize is available. The Grand Prize consists of US$1,000,000. I would LIKE TO WIN PCH “SUPERPRIZE” $1,000,000.00 #GWY 3577 AND $5,000.00 SHOPPING SPREE #GWY 3727 FOR JAN 20TH, #Plus CASH PRIZES, CASH SWEEPSTAKES,CONTEST WIN MONEY CREDIT SWEEPSTAKES, HOLIDAY HOME, SWEEPSTAKES WIN MORE SWEEPSTAKES GIVEAWAYS all PERKS THANK YOU. I would LIKE TO WIN PCH “SUPERPRIZE” $1,000,000.00 #GWY 3577 AND $5,000.00 SHOPPING SPREE #GWY 3727 FOR JAN 20TH, #Plus CASH PRIZES, CASH SWEEPSTAKES,CONTEST WIN MONEY CREDIT SWEEPSTAKES, HOLIDAY HOME SWEEPSTAKES, CAR, GIFT CARD, INSTANT PRIZES,LOTTERY PRIZE MONEY, SWEEPSTAKES WIN MORE SWEEPSTAKES GIVEAWAYS all PERKS THANK YOU. Oh yes PCH I want to win PCH GWY 3727 plus PCH GWY 3148 on Dec 16th superprize. Please I’d like to claim entry for each PCH GWY 3727 $10,000 cash prize plus PCH GWY 3148 $1,000,000 on Dec 16th for my chance to be PCH SuperPrize winner making all my dreams come true. Thanks PCH and God bless!!! Oh My Sweet Vegas World Sweepstakes, Please Take Me Away From My Dreary Daily Home.My Life has been lifeless for so many Years now,I’ve been Retired four 10 + Years now & not by Choice I’m in My 50’s & I’m more than ready to Unleash the Gambler in Me, Because I Love GAMBLE & the only thing better than GAMBLING is WINNING. I’M A SURE THING TO BE YOUR VEGASWORLD SWEEPSTAKES PERSON. What happens in Vegas Stays in Vegas, My Husband & I Could use a exciting trip or get away or stay away. I’ll Play Black Jack or Slots Machines and make funny noise in My Dream júst so We Can get away. I’m a girl so let Me Dream and then send us away to HAVE SOME FUN. SO REMEMBER WHAT HAPPENS IN VEGAS REMAINS IN VEGAS , EXCEPT THE MONEY OF COURSE OR NOT. WE WANT TO GO ANYWAY. TRULY VEGAS GET AWAY ! ! (+;+) (+;+)….